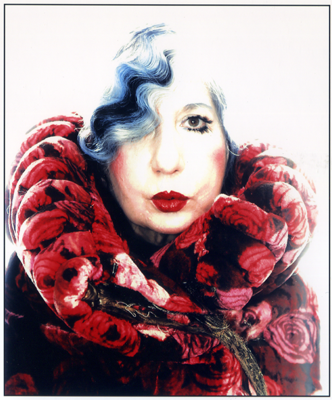 Today is the 86th birthday of fashion Icon Anna Maria Piaggi. Her style was legendary, like Isabella Blow, Edith Head, Iris Apfel, Daphne Guinness and Grace Coddington to cary on the her artistry. He was an original and the world was a better place because she was in it and still feels the loss that she has left. BEST KNOWN FOR: Italian fashion writer and style icon. Piaggi was born in Milan in 1931. She worked as a translator for an Italian publishing company Mondadori, then wrote for fashion magazines such as the Italian edition of Vogue and, in the 1980s, the avant-garde magazine Vanity. She was known especially for double page spreads in the Italian Vogue, where her artistic flair was given free expression in a montage of images and text, with layout by Luca Stoppini. Since 1969, she used a bright red manual Olivetti Valentine typewriter for her work. Piaggi had a large clothes collection, including 2,865 dresses and 265 pairs of shoes, according to a 2006 exhibition at the Victoria and Albert Museum in London. She dressed in an exuberant, unique and eclectic way, never appearing in the same outfit more than once in public. Such was her influence and knowledge in the fashion world, Manolo Blahnik dubbed her “The world’s last great authority on frocks”. Her associates in the fashion world included the fashion designer Karl Lagerfeld (from the 1970s), who has often sketched her, and Manolo Blahnik, who is the designer of many of her shoes. She was the muse of British milliner Stephen Jones. She was also an admirer of British clothes designer Vivienne Westwood and her hats, made by Prudence Millinery. She lived in New York and visited London and Italy periodically since the 1950s. Piaggi appeared in the documentary Bill Cunningham New York on the New York Times fashion and social photographer Bill Cunningham.